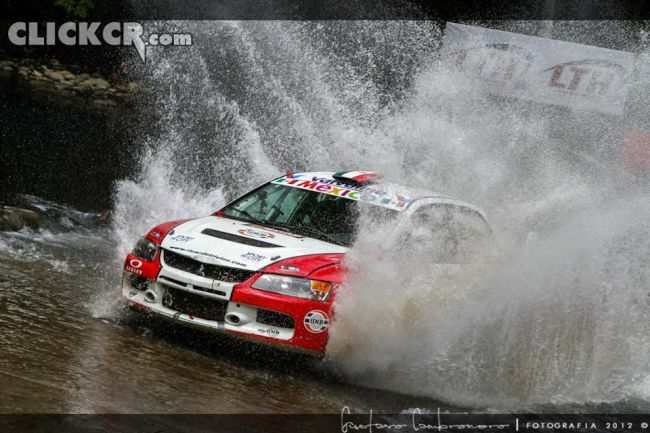 do WRC cars take part in NACAM rally as well? how much competitors in total? Finally some wireless and its bad news to report. John was starting to find some rhythm after Jose took the first stage. John won stages 2 and 3, then on stage 4 went off the road, busted tire, broken rim, and has damaged the brake line to the front. Otherwise no other damage. He was pushed back on the road by spectators, changed the tire, and made it back to service. Unfortunately he has probably lost about 6min which has cost him the lead. Real shame as he was comfortably beating Trivino on some neutral ground. He will not miss any stages but the win is definitely not possible. The luck continues apparently. Will keep you posted. so cadiz is officially international Wagon r? I am terribly sorry for the slow updates this trip. It was nonstop go from Wednesday night that we got there. The crew is al back. John, Sobby, and myself left Liberia in CR at 1am this morning after no sleep from the Rally and drove 4hrs to San Jose, to catch a flight at 8am to Panama then to Trinidad. We are all back safe but completely exhausted. I have a great report in the works, as well as what should be a proper video. Managed to get 3 go pros on the car this time, including the run off. Expect a full report tomorrow with pictures - so much to tell, but for you very patient fans of this tread hold this for now. - John and Mike - 4th overall, 2nd in NACAM (Not all drivers were entered in the championship), managed 3 stage wins and twice was second on the stage by no less than 2-3 seconds. I have made contact with a lot of the NACAM press people so i was able to find some of these from other photographers. 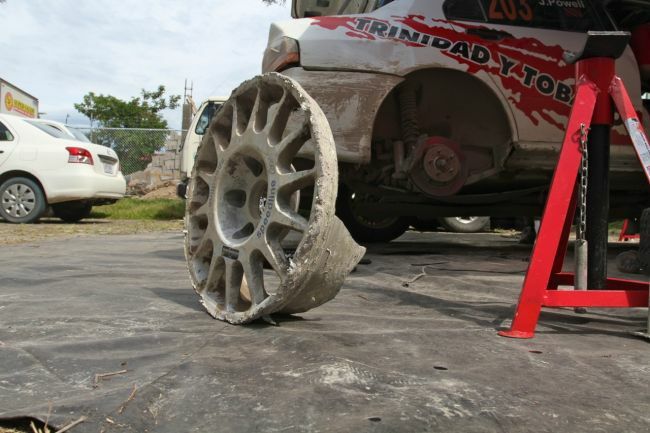 holly sheit broken rally car rim! ouch! So that is the new-style lightened ( but definitely not balanced ) Rally rim? Send it back to Speedline and claim manufacturers defect! "John entered, but Murphy was in charge!" Wait, what you trying to say? You is the real Murphy? Great job team. Looking forward to pics , Video and final report. taken off NACAM facebook page. 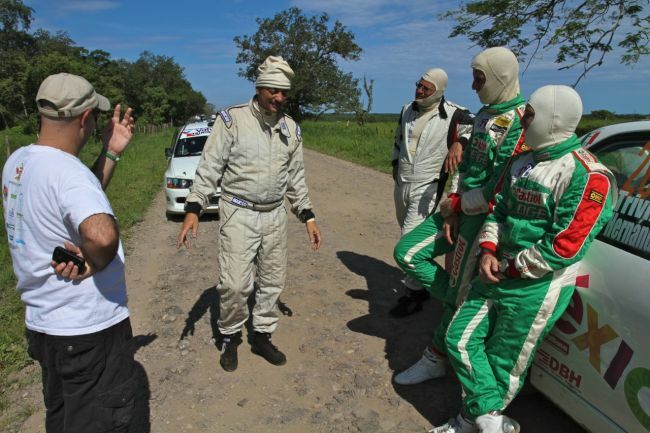 It seemed since the beginning as a highly competitive rally and it did not disappoint anyone, as the duel between the NRC drivers Ricardo Triviño and John Powell with local Jose Montlato developed as of section 1. 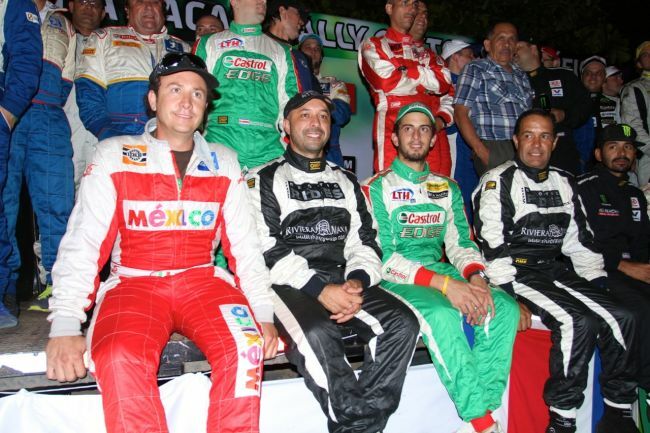 In class 8 the local NRC representative Andres Molina, Venezuelan Alejandro Lombardo and Mexican Mario Fernandez also knew that the race would not be easy, as did Panamanian Dante Pescetto, who aboard his Peugeot 206 would seek to outreach his rivals in the upper class. 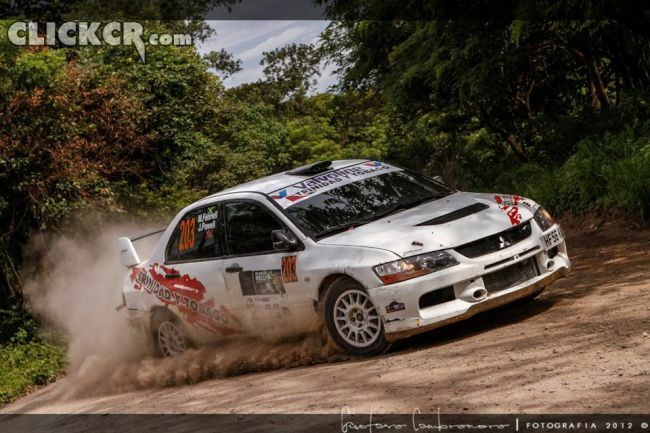 The crews took the start on Saturday morning, with championship leader Richard Trivino opening the route, followed by Powell, both in Mitsubishi Evolution IX and Montalto commanding his Subaru Impreza WRX STI. After this first run the local star established a considerable distance between himself and his pursuers, which provoked a reaction from the internationals at the following sections. With the clear aim to get as many points as possible, the first one to react was the Trinitarian Powell, who got the scrtach in special stages 2 and 3 and with this cut the gap to just 3 seconds before the start of stage 4. Unfortunately in the latter would suffer an off due to lack of visibility product of Montalto's car powder, that was not dissipated. To his fortune, the dismissal was not final, however it caused the loss of 6 minutes, after hitting the fence and gettting stuck out of the way with a cutted-tree trunk, breaking a wheel and rear right brake pipe. 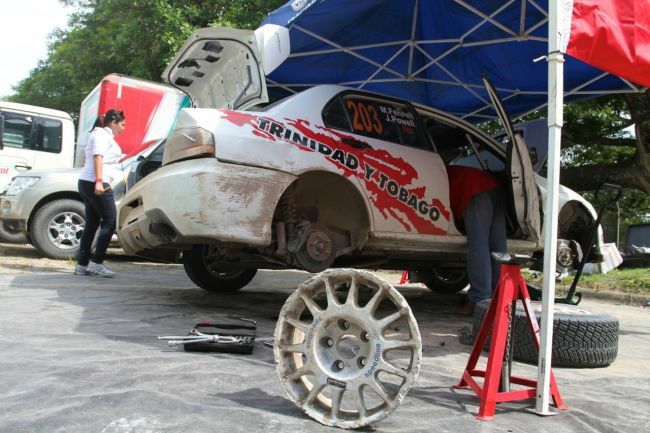 After this stage they went directly to the service area where his team would work hard to repair the problem. 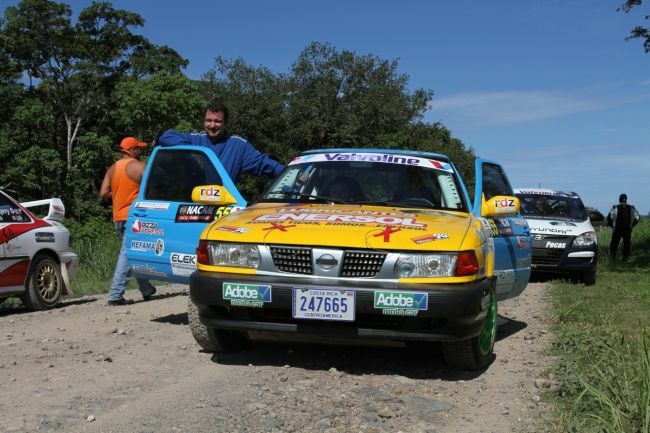 With this, the battle was centered between Montalto and Triviño, with an advantage of 28 seconds for the first half of the rally. The second half of the event would be as exciting as the first, as the Mexican would be on a mission, trying to overcome the difference in order to obtain the highest position on the podium. The Mexican Triviño was going to get the fastest times in all of the evening’s stages, with Montalto putting out a great resistance. 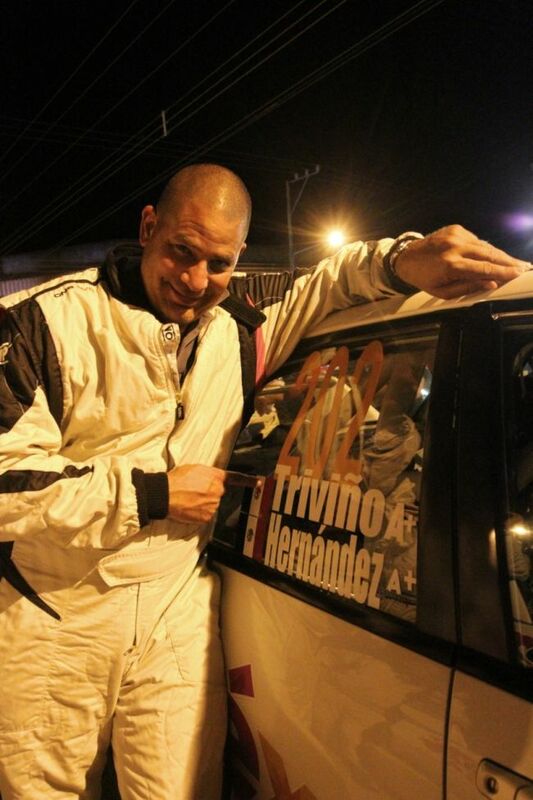 With an impeccable job, Triviño could take first place in the Rally Costa del Pacifico 2012, with Jose Montalto escorting him in the second position. 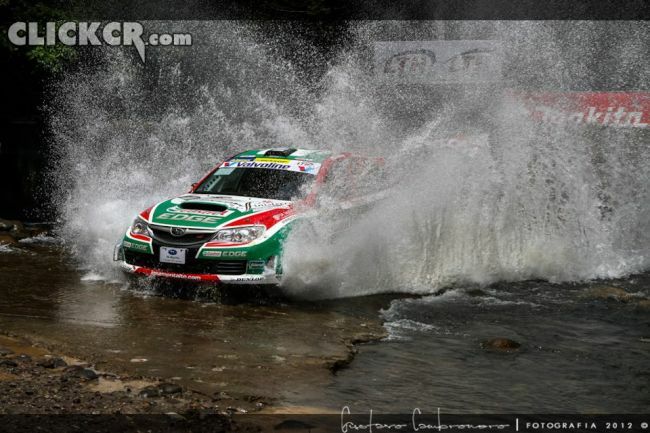 The podium was completed by Montalto`s teammate, local Juan Carlos Alvarado, also driving a Subaru Impreza. 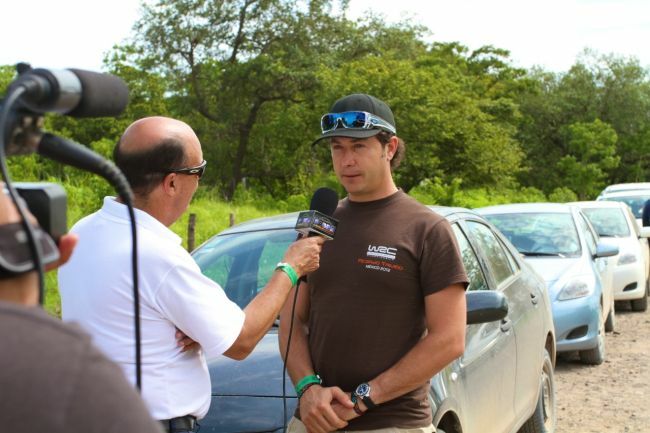 John Powell managed to climb back to 4th place after the off road, followed by Andres Molina, who in his KIA Class 8 Ceratto dominated from start to finish. 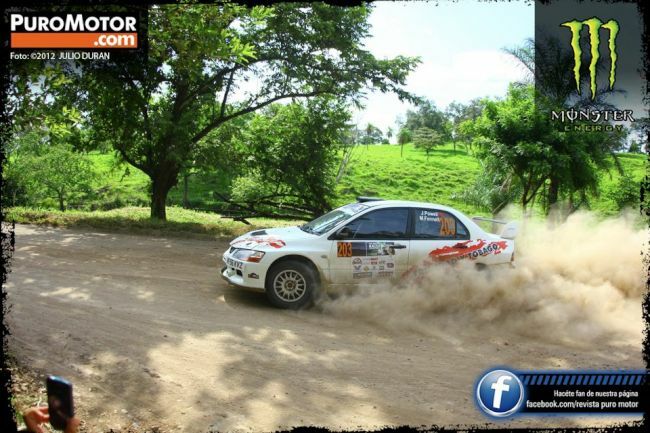 Alejandro Lombardo in his Mitsubishi Lancer followed in Class 8 of the NRC, thus obtaining the second place that keeps him as the class leader at mid-season. 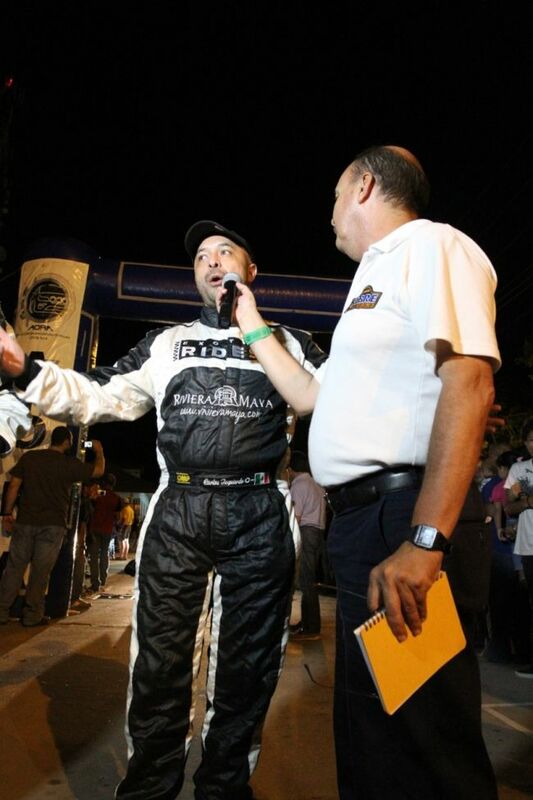 Mario Fernandez fought with electrical problems in his Renault Clio, which were to prevent him from finishing the competition. 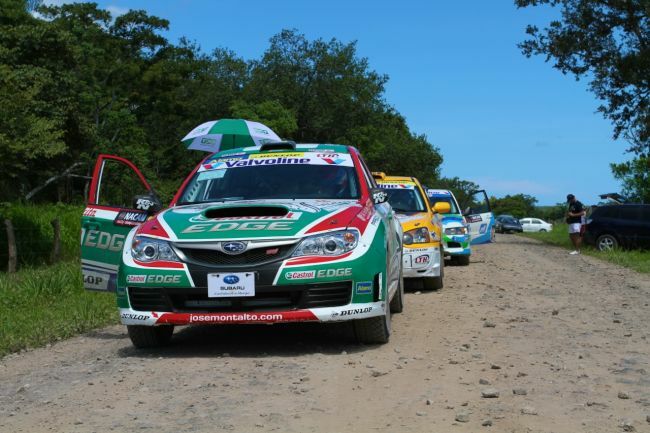 Who also faced problems in the last stage was experienced Panamanian driver Dante Pescetto, because the car’s fan stopped working, which was a problem with the high temperatures in the region of Guanacaste. To his fortune, he managed to overcome the problem and bring the car to the finish line. 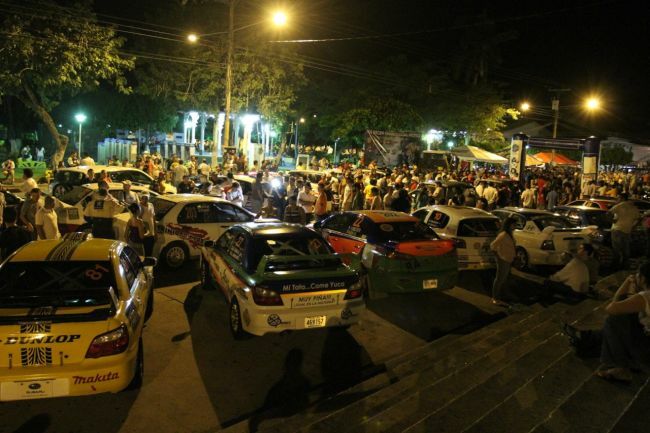 Thus concluded a successful Rally Costa del Pacífico, which was the enjoyment of crews and fans, who filled the roadsides and saw a very interesting duel between national and international teams. 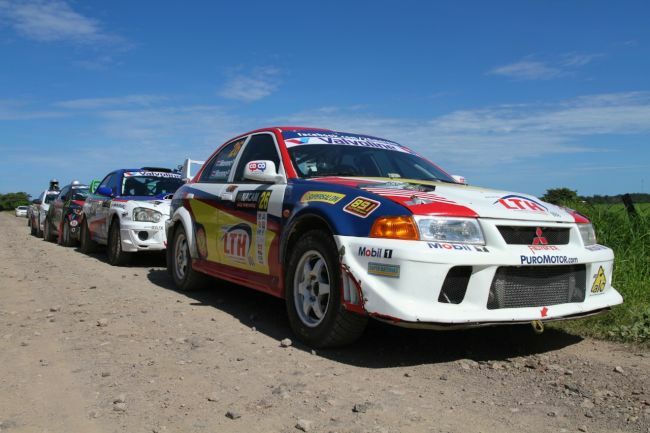 For now, crews will have a short break, reaching championship’s summer break, in which teams will work to adjust their vehicles and prepare strategies to resume rallying throught the routes that Peru has in store for the activities of the NRC at late August 2012. So Round 3 of the Championship is complete and John and Mike have made their presence very felt on the series by picking up some convincing stage wins, however what should have been a well deserved overall win turned out to be another reminder of the tough world of Rallying. The logistical problems as well as the slightest of errors have resulted in a 4th place overall (2nd place in the NACAM Series), but in all fairness should have been a win. The Team arrived on Wednesday hoping to meet the car in good working order. You would remember that the Engine was replaced after the last round in Mexico. However we met the car with some cosmetic shipping damages (lights, bumpers, etc) as well as some much needed parts did not arrive, the new fuel bag, radiator, fan assembly, etc. Apparently no transport trucks are allowed to enter or leave the Mexican border, so all the trucks had to be offloaded, and re-loaded at the Mexico/Guatemala border (new trucks, trailers, documentation - the works). So the crew from Dom Buckley (Colin, Pete, and mastermind Phil Marks) arrive a few days before and got to enjoy a couple days of rest in San Jose as they had no car to work on. With an impossible task ahead of them, they got the car Thursday morning, with no parts and were given a deadline of 9pm that night to complete all works and have the car ready on the transporter to be sent up to Liberia (4hrs drive North). After all the drama in Mexico it was simply a punch to the stomach with these problems continuing. To make matters that much worse, the Service Truck with all the spares that John ordered was stuck on the Costa Rican port and was never cleared. John bought a truck for the series but was advised not to ship it in to Mexico as it would be too difficult to get it in and out with their Customs regulations. So midday on Thursday, just got the car, no spares, no truck. Basically we all discussed heading back home. John has to be commended on his 'Never Say Die' attitude as he remained completely positive and focussed on finding solutions the entire time. Also to add to the Sh^t list was the fact that co-driver Mike Fennel who was delayed in leaving Jamaica was only meeting us on Friday evening after the scheduled pace note allotted time. Basically it was chaos. No Car - No Parts - No Navi. Thursday afternoon arrives and while the fuel bag appears, apparently it was re-loaded into Trivino's spares leaving the Mexican Border by accident. But the fuel lift pumps are nowhere to be seen. Ok - call Mexico and find out who packed them. Right Fuel Pumps located in another box, but no radiator as this was sent in the Service Truck which was stuck on the port. Just about every solution was discussed, then finally a radiator is lent to John from a street Evo, but no fan. This is at 8pm Wed night and the transporter for all the cars is waiting on John to load with the organizers looking at a loss for words. The Team would also love to drive the car the 200km north to break the engine in but obviously impossible with no radiator. Plan - start the car with no fan, load it on the transporter and figure out the best case scenario in Liberia on the Friday while the John does pace notes with a makeshift Navi - enter Stuart Johnson and myself - the standard issue substitute navi. Working right through the evening mounting up skid shield, radiator etc. So with tensions high we begin the 4hr drive to Liberia to the hotel. It would be a good time to point out that Costa Rica does not have any highways and the road although nice and smooth is the main transit across the country and is full of daredevil truck drivers in big rigs. I mean its 10pm at night and we are playing live Mario Kart against 18-wheeler semis, with Powell, me and Phil in a Toyota Yaris, while Sobby and the rest of the team minus Mike are following in an SUV loaded with suitcases and the few spares. 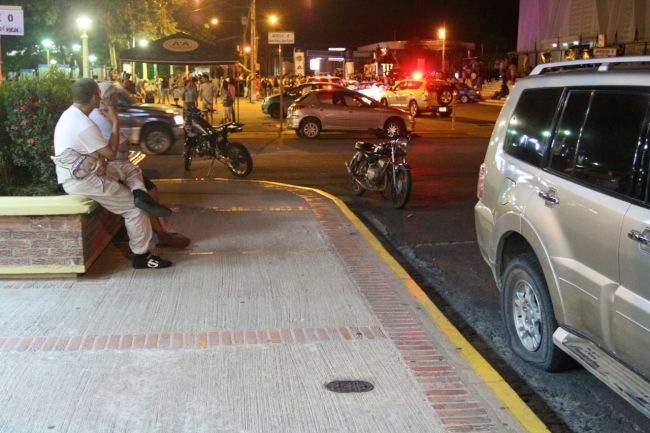 Welcome to the Rally Costa Rica hahaha. So we arrive a tired bunch into Liberia and head to the hotel which is on the Pacific coastline. 1AM find a bed and sleep. Wakeup call Friday 6am and head to breakfast to discuss the plan for the day. 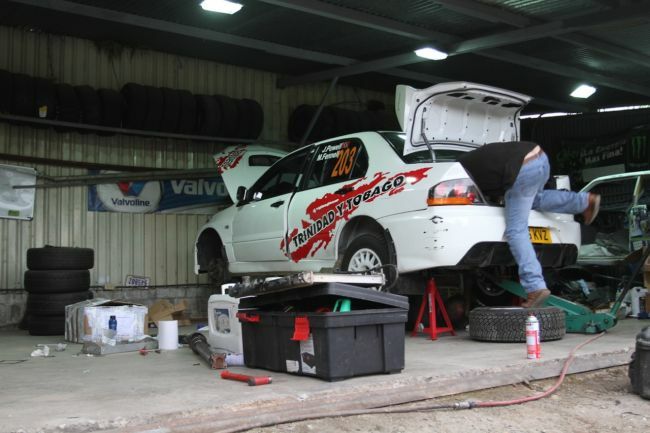 Peter Clark, and the Service Crew deal with the car and scrutineering, while John, Sobby and myself go to do pace notes. The NACAM competitors drive in convoy, first stopping off at Central Service to see where it is, then head to the stages. 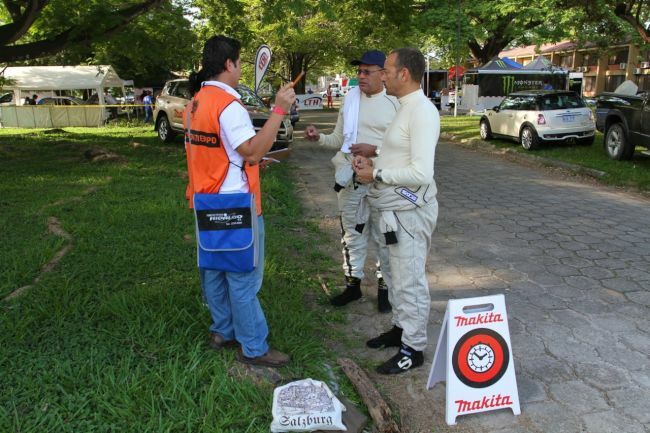 The Costa Rica national championship drivers had the week to do their notes. 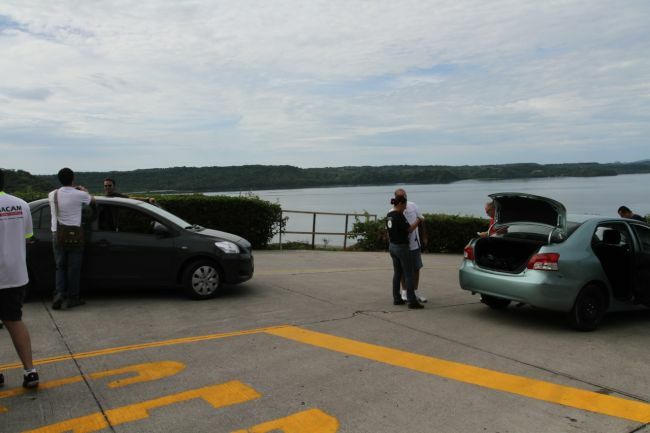 All teams arrive at the start of stage 1 (everyone's in a YARIS by the way) and begin the 22km recce. I got the job to write notes while John drives and Sobby points out anything of danger he could add to the notes. The first drive through is behind other cars so dust is immediately an issue. You go back for a second pass and if you don't get the notes right, tough luck. The first stage is long, flowing, 4 different surfaces, including freshly paved tarmac, 3 water splashes, and bloody fast. Notes are key and this is the first time i have ever taken notes for John far less under the pressure of get it right the first time. So went the nervous note taking of the remainder of the stages. 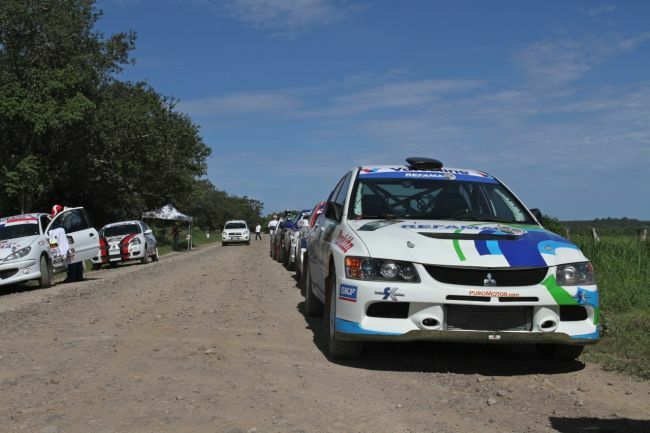 2 different stages run twice forward and twice backward to make up the 130km. The second stage was actually piece of the first one which made things a little easier, but it was like our old Rollercoaster stage, and i think a large pair of brass testicles may have been required. Loosely translated, notes were key. 4pm Friday - End of notes, rush back to Service where Mike has arrived with a fan from Jamaica. John wants Mike to see the stages so me and Sobby rush back to the stages (15min away) to fight the fading light. Mike makes numerous changes to suit the driver, and we high-tail it back just in time for the ceremonial start where the crew needs to be in full gear for 7pm. The Ceremonial Start was similar with big crowds, all drivers in full apparel, with the crews going over the Start line after some short speeches and interviews. Not as picturesque as the old town of Oaxaca in Mexico but definitely a really warm welcome to all the teams by the Liberia crowd. Ceremonial start is finished but not before we get a flat in the SUV, and the little jack in the back couldn't jack up a go-kart. So Peter Clarke has to bring the Rally jack back to town for us. The reason i've gone in to such detail is to illustrate how tough this is in a foreign land, where you don't speak the language and have to figure out a solution to literally the slightest of problems. We sort out everything, pack the SUV with fuel, tires, the few spares, and we eventually get back to the Hotel around 1am (remember we have been up since 6am the morning before). In the mean time we get word that Trivino is having ECU mapping issues, and Izquierdo (winner in Oaxaca) has blown his engine in a short test to correct a misfire on the Friday evening. HMM maybe our bad luck was contagious. At least we felt comfortable that it was not just us having major difficulty. Sat morning 6am - Rally Time - tired but anticipating a good day. John drove the car back and forth from Service to the hotel and managed to put about 150km on the new engine by the morning. The morning prep goes surprisingly without incident and John and Mike head down to SS1, with Sobby and I following in the Yaris. 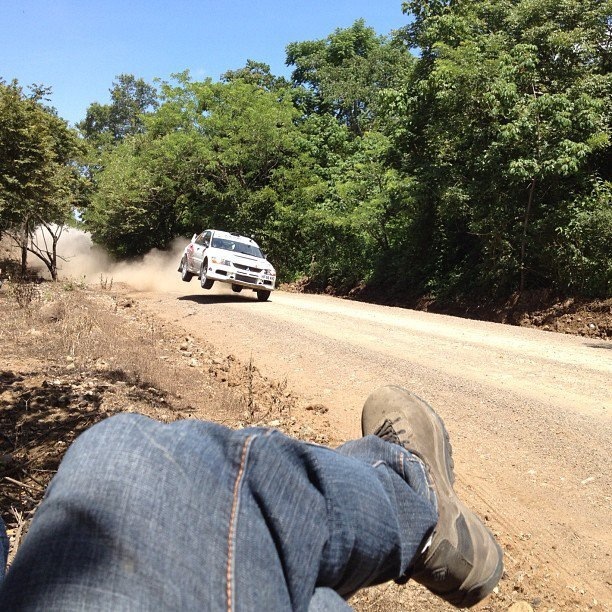 Start of SS1 is delayed as the organizers have challenges locking down the 22km stage. They eventually shorten it to 18km to please some of the residents and we get going about an hour later. The weather forecast called for thunderstorms the entire time, but the sun was out in full force, and apparently so were the bugs. Compare it to rain flies swarming, they would go all between your shades, up your shirt, down your socks everything. So all the drivers remained in full race suits while Sobby and I swatted away. The competition at this point looked to be John, Trivino, and a few of the locals in Subaru's (N15, and 2 N10's). 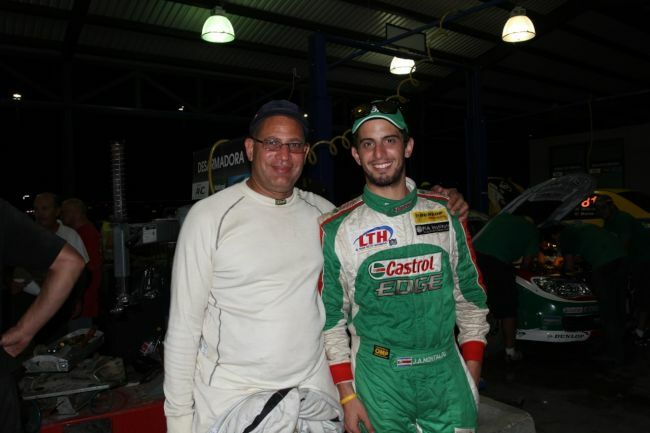 Jose Montalto is the Costa Rican champion - 22 years old and an FIA Pirelli Star driver. 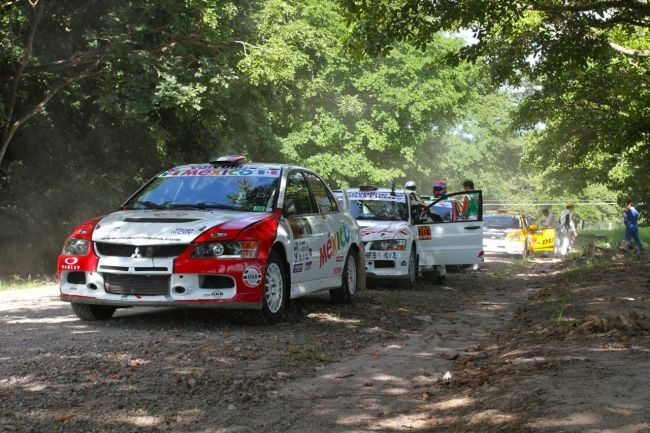 SS1 and Jose catches John and Trivino fast asleep. Jose puts 20sec on John and a few more on Trivino. Good news is that the car is perfect, and John is already ahead of Trivino, bad news - de young boy reeaal quick!. Not to be outdone Penti put it on them for SS2 and 3, and heading into Stage 4 (last stage of the morning and last of this particular stage) just 3sec back of Jose, and a very comfortable 22sec lead on Trivino. Were things finally going our way? The mood was high and then the unthinkable happened, well disappointing to say the very least but i guess expected given the substitute paces notes. A left 3 was called as a left 5 (no real fault of Mike's - the notes were no where near what was required) and John went off the road. Narrowly missing 2 trees front and rear, they luckily escaped with just a punctured rear right tire, but stuck and needed spectators to pull him out. 6 minutes plus are lost but at least he drove out the stage and is still in the Rally. 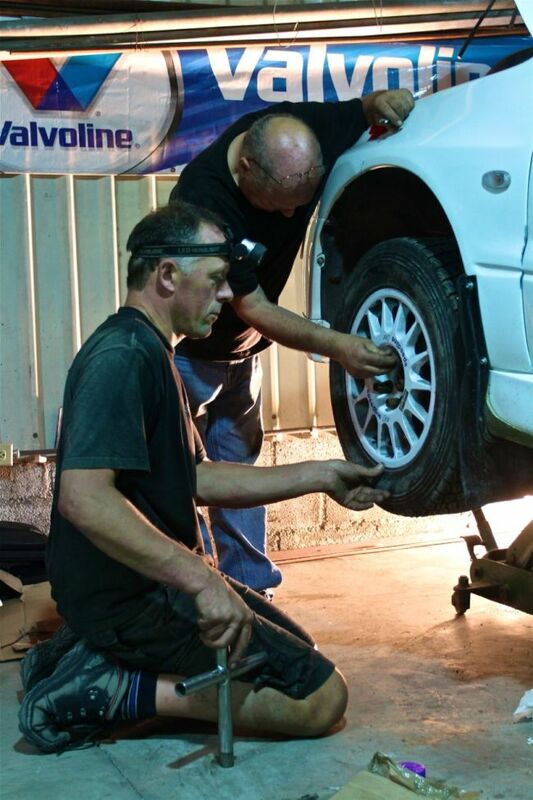 John hurries back to Service, in the process shredding the tire and wheel, which cuts, the lines for the brakes and rear differential. Big brake kit means no spares to borrow, and the simple puncture now turns out to be a costly one. The crew manages to very solid patch but sends John back out with no rear brakes and no rear diff. The afternoon stages go without incident and John manages some impressive times even without some much needed parts working. He loses a few seconds to Trivino on each stage and any intention of winning at this point is soon forgotten. It was a bitter pill to swallow as John could have won this Round, and in the process beaten a top FIA Rally young driver. 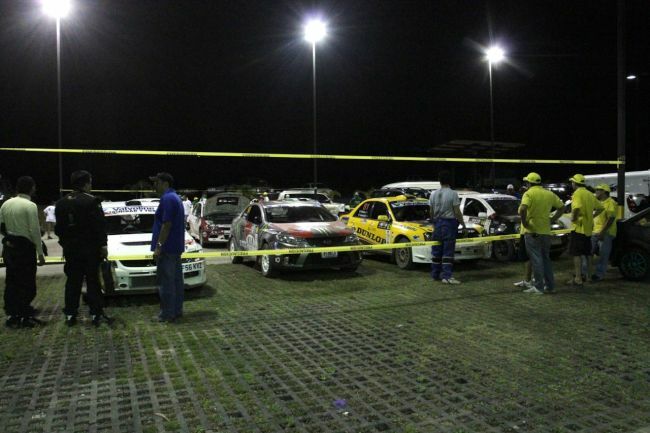 The Rally ended late due to the delay at start, and all the winning cars go back to Service to be scrutineered. To put it lightly they were completely stripped apart. The FIA Scrutineers checked engine capacity, gear ratios, and all sealed components. The transfer case was pulled as well making the already tired service crew work ridiculously hard to put the car back together before they fly out the following day. Checking Engine cc and Gear ratios with a special tool and rolling the car forward manually. Crazy level of scrutineering. Scrutineering is passed without any issues, and we head back to the hotel around 10pm. Time for a shower, a bite to eat, a short nap, and then saddle up at 1am to drive back to San Jose to catch an 8am flight to Panama and then to Trinidad. Sobby, Mike, and Peter attended the prize giving and that was all she wrote. At the end of it John and Mike are definitely on pace and able to better top level Group N competition in Central America. John IS fast but Trivino is consistent. The man does not make mistakes and he has been fortunate with the car surviving. By contrast John has had no end of car problems, logistical problems, and in this instance a small mistake cost him the win. So from a critical point of view Trivino's experience at WRC level and obviously having competed more at other major championships that involve lots of logistics IS an advantage. John may have to get lucky with the logistics and go more conservative on the driving (knowing that he is on unfamiliar territory) if he is to win. There are 3 more rounds to go, and John looks like he can manage 2nd overall pretty easily but knowing that he has the capability to beat Trivino on the gravel will make not winning this Championship tough. The math says that Trivino is too far ahead half way through but who knows what lies ahead. Next is Peru which is very high above sea level and the right tuning will be absolutely key with the low oxygen. Phil Marks is probably one of the best Evo men on the planet, so stay tuned. Its important that the guys behind the scenes are mentioned, Dom Buckley are a damn committed bunch, and they work regardless of time, task, weather, or situation. Phil Marks may have a few different opinions on life but his skill with a laptop and commitment at this stage of his life is insane. Peter Clarke from Jamaica once again handles all team logistics, from lunch to the documentation, to protests in Spanish. We had Sobby with us this time, and he thought he was coming on vacation to watch Rally Costa Rica......hmm great intentions but not reality, Sobby drove one of the support vehicles, helped pace notes, and was an integral part of getting through this tough weekend. Last edited by rcadiz on July 10th, 2012, 10:43 am, edited 1 time in total. 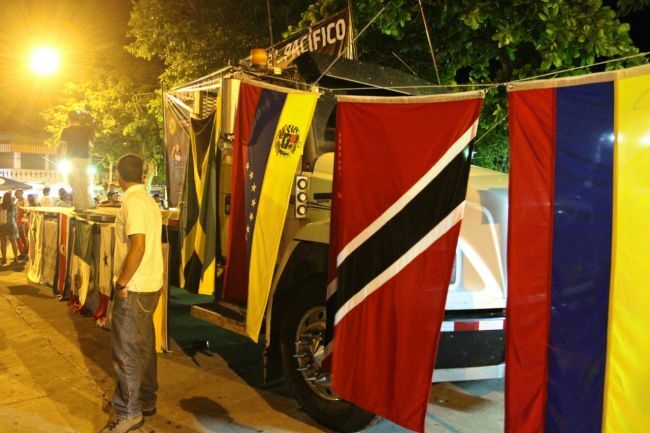 Like you eh realize you were in central america or what? and that's not just a B13, It's a Tsuru aka V16, and those engines / gearboxes and front and rear fascia were a lil hard to get on this side, and fetched their coinage accordingly. Excellent and very thorough write up. It certainly helped paint a picture of all the trials and tribulations the team has faced. I have the in-car of John's off. The Costa Rica vid as well as the Mexico vid will be posted soon. 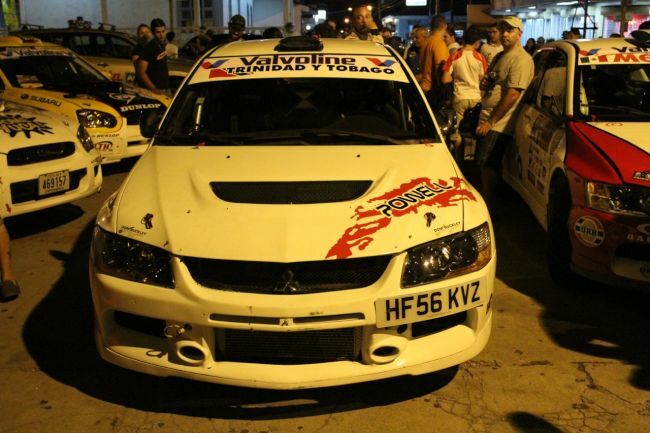 And forgot to mention that Penti may have offered, i repeat 'may have' offered his Evo X to Trivino if he wants it for Rally Trinidad next year. 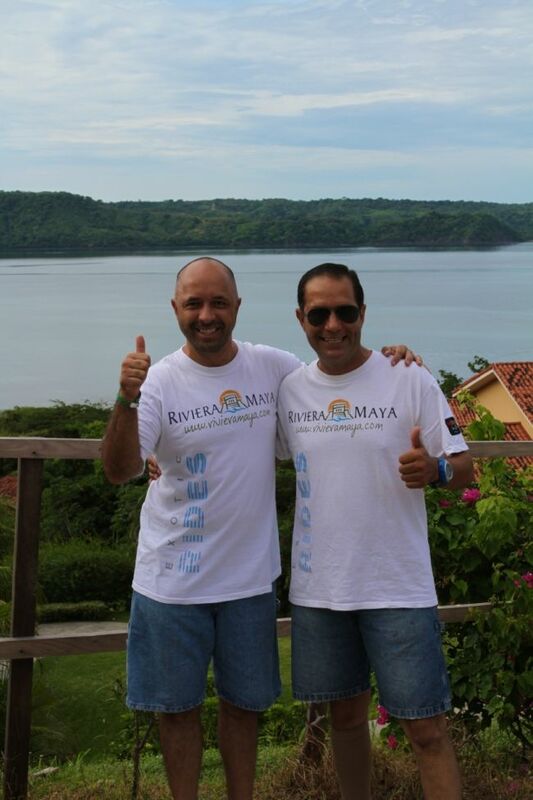 And Jose Montalto from Costa Rica is very interested in coming to Trinidad. 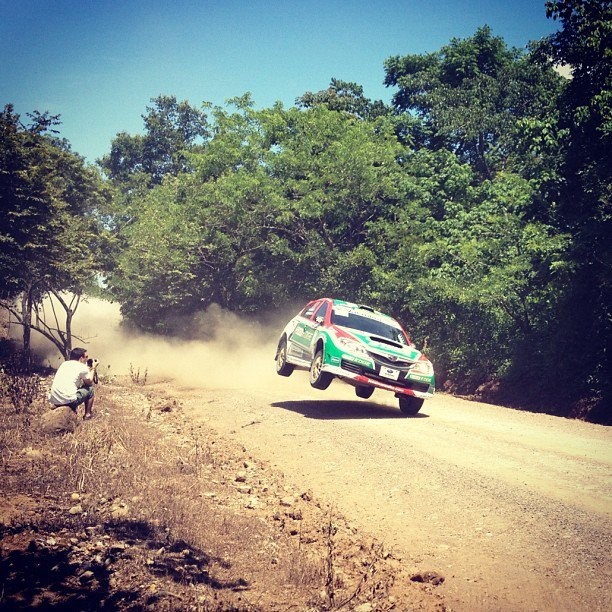 The only challenge is Rally Mexico WRC is very close to our event. So we shall see. Both these guys are very quick. Excellent coverage Robert, I suspect you could get paid to do this, you need to sell this to the Express or Guardian for the upcoming Rally in Peru. While I am no where close to John's level, I have told him a few times; that 'you need to finish to win' See quote from your report. When he wins, it would be spectacular though, he does not know the word 'Conservative'when it comes to competing. Best of luck in Peru, keep up the good work you all.